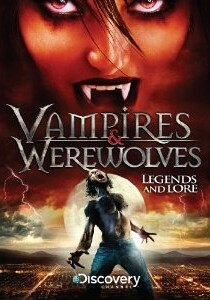 Coming November 1st is the DVD Vampires & Werewolves: Legends and Lore by the oh so wonderful Discovery Channel. The DVD contains all sorts of goodies for both vampire and werewolf fans. Obviously here on Werewolves.com we don’t care much for the vampire section of the upcoming DVD, so we’ll just focus on the werewolf part, which contains not only segments on werewolf history and lore, but it also contains The Discovery Channel’s fearsome werewolf mocumentary Werewolves: The Dark Survivors. The film follows a young documentary director’s search for an animalistic serial killer. When he is allowed to ride along with the lead detectives on the case, the discovery of a new suspect launches the investigation into a terrifying new direction. Werewolves: The Dark Survivors is so realistic and believable that after it aired I had a surprising amount of readers come here believing that it was 100% true. Sadly, it’s just a mockumentary, but a damned good one. I can’t wait to pick this DVD up, I already added to my Amazon wish list. As someone who loves both vampires and werewolves and has an obsession with folklore this is the perfect DVD for me. What do you guys think? Will you pick it up when it comes out?